The years 2018 & 2019 have proven to be one of King Monada's greatest years career-wise, well apart from him getting snubbed for that song of the year title. But anyway, King Monada has been hard at work not only making South Africans dance to his tunes but also hard at work at ensuring that his wife is happy as well. See when you're a man that is as busy as King Monada, it's easy to fall into the trap of neglecting home and your spouse, so it is always advisable to take a breather and do something special for those that matter the most. 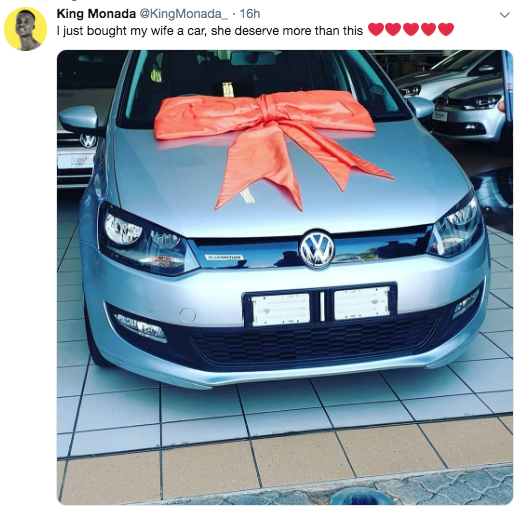 The King revealed that she just bought his wife this car, and even though we would consider this to be a grand gesture, Monada still believes his wife deserves more than just a car. Well damn, what else are you planning on buying your wife King? King Monada falls under a long string of celebrities who have purchased a car for their loved ones. Just recently, Ayanda Thabethe bought her mom a car, Prince Kaybee also surprised his dear mother with a car and actor - Motlatsi Mafatshe and siblings bought their mom a new car as well for her birthday.